Greetings, loyal minions. Your Maximum Leader happened to drive by three grocery stores today during lunch time. If the crowds in the parking lots (of people buying milk, water, toilet paper and the like) are any indication of the level of apprehension associated with the impending arrival of Hurricane Sandy; then your Maximum Leader can only declare that we are all gonna die. And soon. Greetings, loyal minions. Your Maximum Leader sees that this is St Crispin’s Day. That means that today is the anniversary of the Battle of Agincourt. A great English victory over the French in the 100 Years War. A victory that, thanks to the Bard, probably clouds our collective memory and makes us Anglophiles assume that the English won the 100 Years War, which they did not. The best remembrance of the Battle of Agincourt actually comes from the ole Twitter machine where user Michael Gebert (@skyfullofbacon) tweeted: “Christ, it’s St. Crispin’s Day and that means the old man will be showing his arm scars and going on about Harry the King & Exeter all night.” That made your Maximum Leader laugh aloud. Of course, if it is St. Crispin’s Day, that means it is also the anniversary of the Charge of the Light Brigade at the Battle of Balaclava. And overlooked in all this is St. Crispin himself. If you are so inclined, and your Maximum Leader is, lift a glass and remember Harry the King, Bedford, Exeter, Warwick, Talbot, Salisbury and Gloucester and their great victory today. After a few celebratory glasses, you can wallow in the plight of the Light Brigade. And after a night of hard drinking you can be thankful that you didn’t end up like St. Crispin. Greetings, loyal minions. Your Maximum Leader grew up in an area that was, once upon a time, part of the large land holdings of George Washington. 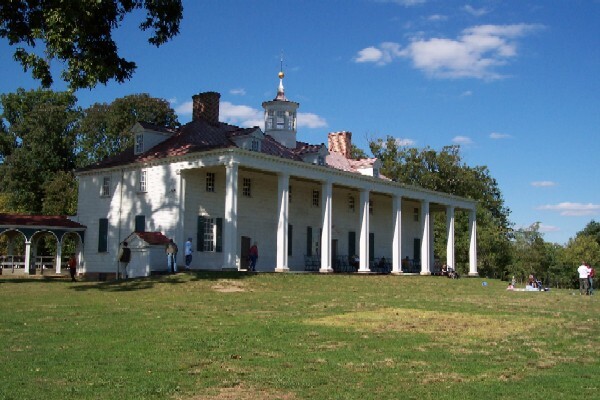 Your Maximum Leader lived close to Mount Vernon and in a strange way thought of Washington as something of a neighbor. A neighbor with a large house with a great view (among other things). So why is your Maximum Leader bringing this up now? Well, a few days ago (in fact on the first of the month) your Maximum Leader mentioned that his good buddy Mark had won an essay contest sponsored by the Ladies Association of Mount Vernon (the owners and maintainers of Washington’s estate - and memory). As a winner Mark was invited to come to Mount Vernon and be schooled in all things Washington and Mount Vernon. Well, by pre-arrangement, your Maximum Leader went to visit his buddy after the day’s programs ended. It was late (after 9:30pm in fact); but a visit with Mark is always a good time. 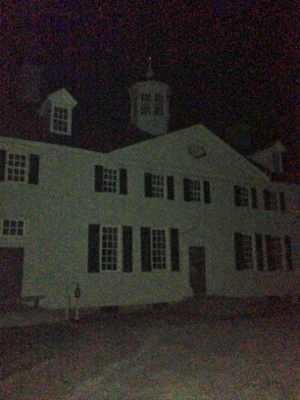 So, after having a drink and some oysters in Alexandria, we returned to the estate. Now, over the course of his life, your Maximum Leader has been able to go many places in Mount Vernon that others normally don’t go. He’s been up to the third floor of the mansion and seen the bedrooms and storage rooms up there. 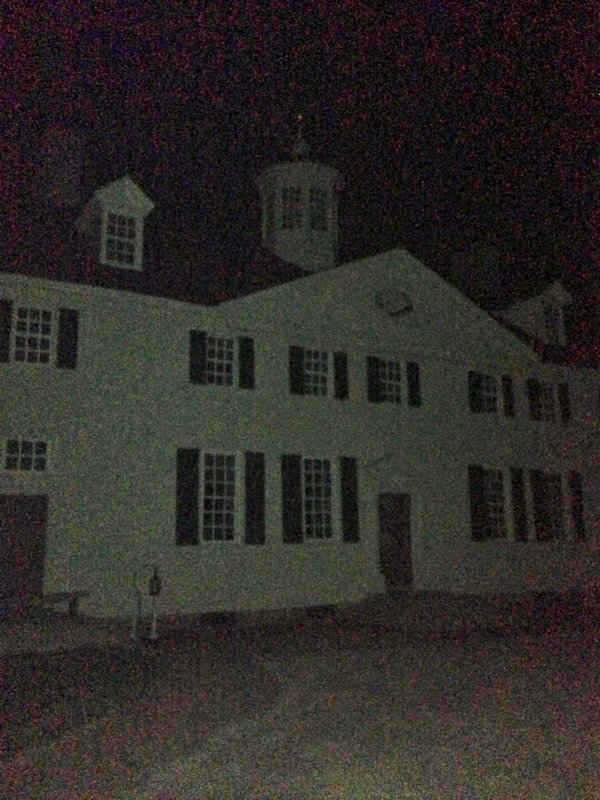 He’s also climbed up to the cupola and looked out of it at the Potomac and the estate. It is pretty fun… But last night he got a treat he’d never expected to get. 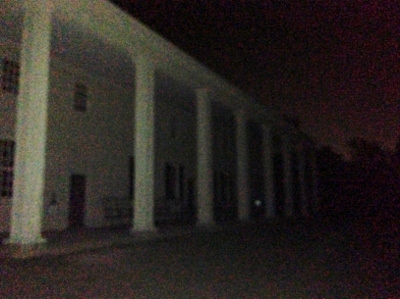 Mark and your Maximum Leader wandered the grounds at midnight. There wasn’t another soul about. It was wonderful. One often never stops to think how a place might be other than the times at which you are used to seeing it. 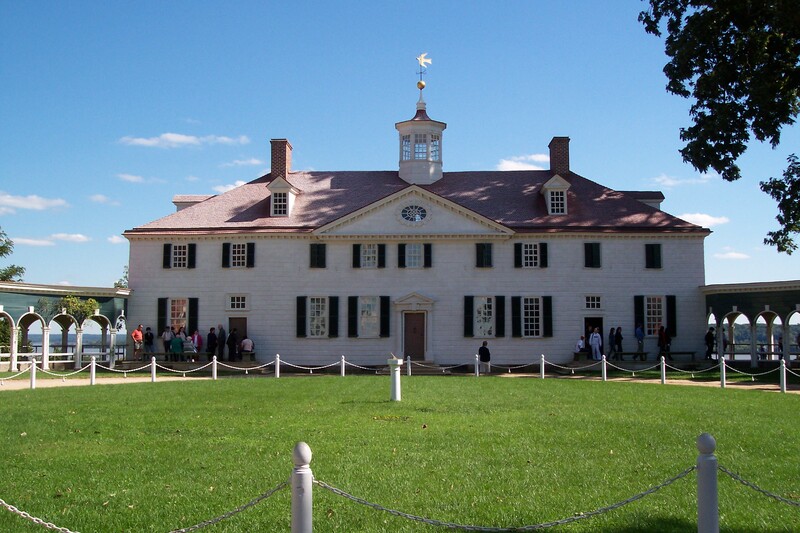 Your Maximum Leader always associates daylight and other people with being at Mount Vernon. But it is a different experience in the dead of night. It is quiet. Real quiet save for the wind and noise of insects. And that there are no other people around gives it a completely unusual feeling. It was very cool. And in case you are interested, you can click here to see the daytime view of the first image (big picture) or you can click here to see the daytime view of the second image. Your Maximum Leader will remember this visit for a very very long time. Thanks Mark! An open letter to our friend Skippy. We hope that you know that among all the bloggers of the world, you are among our most favored. Your political insights and commentary so often mirror what we are thinking that often we don’t see the point of writing on a subject after you have discoursed on it. This election year (in the US) has not been different than past election years in that respect. We, like you, have thought from early on that Romney will be the nominee. We have also believed, as you have that President Obama will win re-election. This is not due to his deserving to be re-elected; but due to Romney and the Republicans being so pathetic. We have read and taken to heart your many exhortations (including the latest one) that we should vote for Libertarian Gary Johnson for President of the United States. After much consideration, we have decided that we could, in good conscience, cast our vote for Governor Johnson. He is a sensible Libertarian, and although we don’t agree with him on all the issues - as if we have ever agreed with every candidate on all the issues, he does have a reasonable plan for addressing the most pressing problems facing the United States today. This is a big step for us. We normally don’t believe in voting for 3rd party candidates in national elections. We believe that voting for the 3rd party candidate is not a “protest” vote in a meaningful sense but more “throwing one’s vote away.” This year though, the two major party candidates just aren’t doing it for us. So we have thought long and hard about voting for Governor Johnson. We wouldn’t need to see a talking head on some cable news program to tell us we are living in a swing state. We’ve lived it for nearly a year now. You can’t turn on the TV or radio (or often the interwebs) without being bombarded with political ads. You know, for years we’ve wanted to see all the attack ads and know what it is like to be a contested marketplace. Now we’re wishing we could go back to the days when the only time you saw a political ad was when it was highlighted on the news or when you went looking for it on the interwebs. It has been hell. The ads are maddening in their omnipresence. It is enough to drive a man to drink (much more than he normally does). So, Virginia is a swing state. For the first time in our lifetime, our vote actually does mean something (Presidentially speaking). Now we find we are faced with a major problem. Do we cast our vote for a deserving man (Gary Johnson) who has no chance of winning or cast our vote for Romney or Obama in hopes that our vote does affect the outcome of the national election. We know that the press are reporting that (alternately) Virginia is very close or the President is slightly ahead. According to information we’re getting from people who have access to internal polling from the various campaigns, everything is within the margin of error of any poll. If we thought that Virginia was going solidly for either Romney or Obama, we’d vote for Gary Johnson. But this year it seems to be a more prudent course to use the lesser of the evils approach to casting our vote. Although we don’t think it will help him in the broader Electoral picture, we will likely vote for Romney. He is not our first (or second or probably third - okay he is our second choice actually) choice; but he is a better choice than voting to re-elect President Obama. And just so you know, even using the lesser of two evils approach the choice between Romney and Obama is an unpleasant one. Neither man has a serious plan for directly addressing the most serious problems facing the US. But one man has had nearly four years to work on those problems and has pretty much fucked it up at every opportunity. So, perhaps change is the best course. We’re actually quite disappointed that it has come to this. But there it is. We’re pretty much screwed no matter how we vote; but it is wiser to do it this way than any other. PS - if you are ever down our way, you have an open invitation at the Villainschloss. Your Maximum Leader, although it was late at night and he was dead tired, couldn’t fall asleep after the end of the game. He felt miserable for the Nats players who had accomplished so much this year. Greetings, loyal minions. Your Maximum Leader had ever intention of watching the Veep debate last night. But the best laid plans and all… He didn’t watch. Why you may ask? Well let your Maximum Leader tell you. He was too busy celebrating a walk-off home run by Jayson Werth in an elimination game in National League Divisional Series. Werth battled for 13 pitches (13!) before he got the one he was looking for and knocked it into the visitor’s bullpen; thereby saving the Nationals’ season. Your Maximum Leader and his whole family were jumping up and down in the Villainschloss and creating all sorts of commotion. It was great. We were in such a state we didn’t want to ruin the mood - so politics was out. Tonight will be the deciding game five in the series. We will be watching. Greetings, loyal minions. Your Maximum Leader wishes that in a few short hours he was at Nationals Park rooting on his beloved Washington Nationals baseball club in game 3 of the National League Divisional Series. The Nats did a good job by getting the split in St. Louis in the first two games. Now they need to close this out at home. On the other hand, your Maximum Leader thinks it might have been a little boon to the Nationals to open with the top of their rotation on the road. Sure both of our starters (Gio Gonzales and Jordan Zimmermann) were shaky… That was nerves (mostly) in your Maximum Leader’s opinion. The Cards have had Zimmermann’s number all season, so his rocky outing (in a drubbing we might add) was a combination of nerves and a problem with the Cards. The bottom of the National’s rotation does well at home and your Maximum Leader expects that they will continue to do so. Your Maximum Leader is a bit disappointed that the Nationals are the day game in today. He doesn’t object to day playoff games, indeed he loves them. Your Maximum Leader feels that the Nationals got the day game to assure the Yankees’ game is in prime time. He understands the financial reasons behind this move; but he’d like to see a New York team get the short end of a scheduling stick once and a while. Your Maximum Leader will be closely following the game once it gets underway. He will hope for victory for the Nats. Greetings, loyal minions. 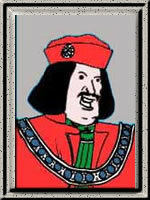 Your Maximum Leader needs to point out to you all that on this day in 1452, Richard Plantagenet, later the Duke of Gloucester and even later King Richard III, was born at Fotheringay Castle. Anyhoo… Take a moment to toast our ole boy Richard on his 560th birthday. The other big news around is very big indeed. The Washington Nationals are the National League East champions. The Washington Nationals are the National League East champions. It makes your Maximum Leader so happy to type those words. Sure the Nats lost their game to the Phillies last night and clinched the division with the Braves losing to the Pirates. But hell, they have won 96 games this year. 96 games! Three years ago they won 56 (or so games). They should be happy and proud. Your Maximum Leader is already working over playoff possibilities in his brain. Just so you know, your Maximum Leader would prefer his beloved Nationals would face the Cardinals or Giants in their first series. (Assuming that the Cards beat the Braves in the wild card playoff and/or the Reds wind up with the best record in the regular season overall. This all assumes that the Cards don’t fold and the Dodgers don’t sweep the Giants in their final series. All of which could happen.) Your Maximum Leader can’t tell you how giddy with excitement he is. He is going to try and get himself some playoff tickets… He might also buy some playoff swag. Your Maximum Leader had a lovely day this past Saturday. Due to heavy rains in the area on Friday night, all of the baseball infields were too wet for play. Thus, the Wee Villain’s baseball game was cancelled. As it was an otherwise glorious day, your Maximum Leader took the Wee Villain, Villainette #2 and your Maximum Leader’s sainted father up to Washington DC. While there we walked around to all the monuments/memorials at the western end of the National Mall. We visited the Jefferson Memorial, the George Mason Memorial (which your Maximum Leader didn’t know even existed - and he must add it looks like it needs some TLC), the FDR Memorial (which he’d never visited before - and he likes), the Martin Luther King Jr Memorial (another first - and the statue is out of proportion to the site and location - your Maximum Leader wishes another design had been selected), the Lincoln Memorial (the greatest of them all), the Vietnam Memorial, the Korean War Memorial, the memorial for the signers of the Declaration of Independence and finally the WWII Memorial. It was a lot of walking on a beautiful day. A great time was had by all. By the way Nats fans… Did you see Michael Morse’s “phantom home run” from Saturday’s game? Your Maximum Leader is having trouble getting the embed video on this site, but you can visit this site to see the “reset swing and home run.” In all your Maximum Leader’s years of watching baseball, he doesn’t recall seeing anything like this. New cask strength Naked Villainy.